After Scotland’s three strongest clans forge a formidable alliance, an uneasy king plots to consolidate power. Knowing that true strength lies in possessing land, fealty, and hearts, he orders sweet Taliesan McHugh to submit to a marriage that will give him control of the coveted McHugh keep. A tender beauty, Taliesan accepts her fate, certain that her lame leg has made her undesirable to any man—until she is swept into the powerful embrace of rugged, devilishly sensual Brodie Armstrong, a warrior who vows to shield her from brutality at any cost. Fearless and bold, Brodie refuses his king’s command to stand down. Instead, he conspires to rescue the rare beauty whose bravery and innocence stir his blood as no woman ever has. 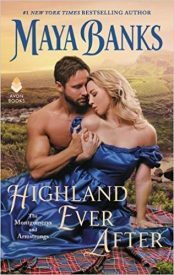 As desperate power struggles reverberate throughout the Highlands, Brodie defies his king and devotes himself to the only mission that commands his loyalty, his blood, and his honor: winning Taliesan’s heart.